Father’s Day isn’t many weeks away so it’s time to start promoting our offers and discounts so that we can increase sales and bookings. But how are you going to tell people about your new offer or discount? Here are five ways to promote your Father’s Day offer. Obviously, your website should be your first port of call. Your website is not only a prime marketing place but also the place where your customers can find out everything about your new Father’s Day offers. If you’re not sure what discounts or offers you could be offering your clients, check out our new Father’s Day page sets. You can easily add these to your website and customise them to suit your business. If you have a blog then this is prime marketing real estate. 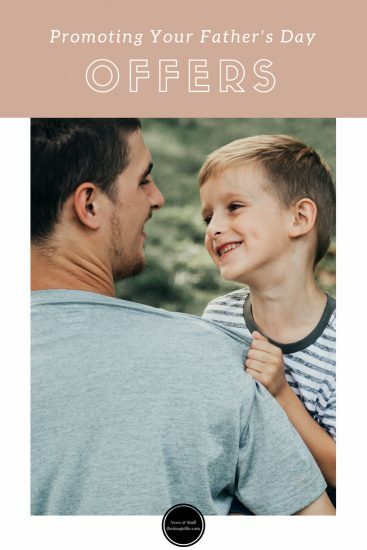 You could keep a banner advertising your Father’s Day offers pinned to the top of your blog so that it is in prime position, as well as sharing related blog posts in the run-up to the weekend. An email newsletter is another great way to get the message out to your existing clients. You could send a designated email to everyone on your email list explaining your Father’s Day offers and linking back to the relevant web page or if you prefer to do a bulk email newsletter, showing everything you’ve been up to recently, you could add an eye-catching banner to the top. If you use social media, then, of course, this is a fantastic way to keep in touch with existing and potential customers. Again, you could post about your new offers and pin them to the top of your feed to keep them in everyone’s mind as well as continually posting in the lead up to the holiday. Regardless of whether you have a designated studio, you can still market to your local area. One of the best, easiest and most affordable ways of doing this is by handing out flyers or postcards. This doesn’t mean you have to stand on the high street for hours on end, but you should ask local related businesses if you could leave some flyers on the checkout desk, in the window or a pinboard if they have one. Equally, you could approach schools, nurseries and local childcare facilities or simply put postcards through local letterboxes.